Cast: Fred Willard, John Ratzenberger, Sigourney Weaver, Kathy Najimy. Written and directed by Andrew Stanton. Story: Trash compressing robot gets lonely. Aww. Running Time: 1hr 38 minutes including intro movie. 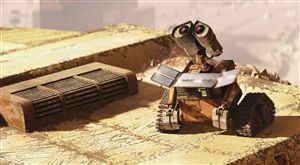 Wall-E is the latest masterpiece from the Pixar artists. You know the drill by now. Poor old Wall-E, left behind on Earth to clear up the mess made by us shaved primates. Still, he's been at it for 700 years and hasn't finished yet, maybe he should get a wriggle on. Too busy pining over an old VHS of Hello Dolly and wanting a bit of robo-lovin for himself, that's his problem. We've all been there. Pixar have long been setting the standard for these animations - from Toy Story through Finding Nemo to last year's peak in Ratatouille, every single movie to come from Pixar has been solid gold. Incredibly, Wall-E's animation is even better than its ancestors, with immense amounts of character being generated from the simplest of robotic movements. The first half-hour is almost entirely dialogue-free, and you don't miss it one jot. As has become the Pixar tradition, Wall-E opens with a short (5-10 min) unrelated sketch, this time about a magician's rabbit who desperately wants that carrot. It sets the scene nicely and effectively cleanses the mind's palate of the unsavoury taste of being advertised at for the past twenty minutes. Thus when the movie starts you're already on its side and the you warm to the hapless little robot from the very first scene. They sure know what they're doing, these Pixar guys. 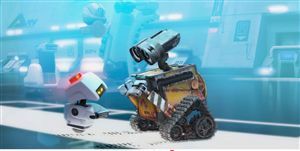 Wall-E is adorable fun for all the family, particularly the kids. Personally I preferred both Ratatouille and Dreamworks' Kung Fu Panda, but that won't stop me wholeheartedly recommending Wall-E to everyone. To enjoy this film you should be: capable of feeling warmth. Wall-E was released in the UK on 18th July 2008.